This is one of the fastest methods for correcting skin tones in Lightroom that I've run across. 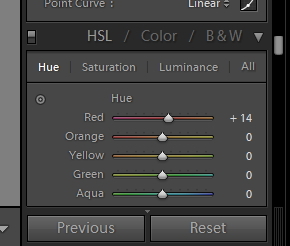 Scroll down to the HSL / Color / Luminance panel; click on HSL for the greatest control. Now click on the adjustment button (just under "Hue"), then click and hold on the area of skin you want to adjust and scroll up or down until you get the right tonality. You can do this in the "All" mode, but for even greater control adjust the Hue, Saturation, and Luminance separately. I find that most skin tone problems are the result of the skin appearing too red. To correct this click and adjust the Hue slightly up, the Saturation slightly down, and the Luninance slightly up. Keep your adjustments subtle, between 4 and 10 points, and make sure you do it after you've finished any "global" tone adjustments.